3. Make DIY heel stays. 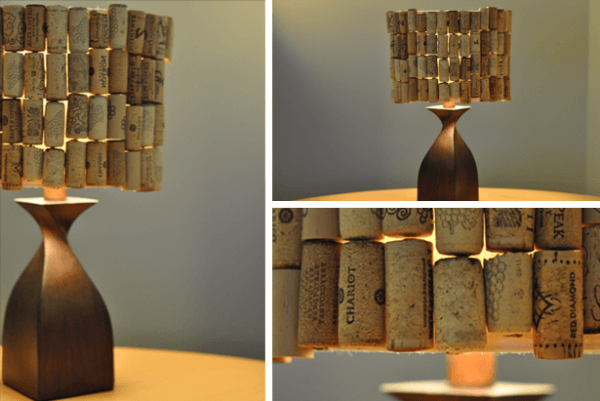 All you need is a cork and some nail polish. See how here. 5. Make a state-shaped cork board. 6. Make wine glass labels. 7. Make place card holders. 8. Upgrade your cheese knives. 9. Make a new bath mat. 11. DIY a necklace or hair clip. 12. Make new drawer pulls. 13. Make labels for your plants. 14. Make commemorative key chains. 15. Fill up your votives. 17. Update your coffee table. 18. Plant some tiny succulents. 20. Keep your chips closed. 21. Make some 3D ombre wall art. 22. Make some outdoor stools. Cover a cheap stool or bucket with corks. Or but this one here. 23. Make a secret USB. 24. Make a shabby chic chandelier. 25. Steady your wobbly furniture. 26. Dress up your lampshade. 28. Make glitter wine stoppers. 29. Create a cork journal. 30. Make these adorable baby cork animals. 32. Make these pin cushions. 33. Craft some easy stamps. 34. Make an animal sculpture. 35. Make them into candles. 36. Make spools for twine or string.